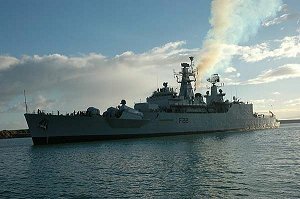 Both Durban and Cape Town received several naval visitors during the past couple of weeks, with a squadron of Indian Navy ships paying an official visit to both ports and a new stealth frigate of the Singapore Navy stopping at Cape Town on her delivery voyage. Visiting Durban were the Indian Navy Krivak class stealth frigate INS Trishul (F43) and that navy’s very interesting fleet replenishment vessel INS Aditya (A59). Both ships berthed at the T-Jetty and were open to the public during the several days spent in port, when a large number of visitors made use of the opportunity to go on board. 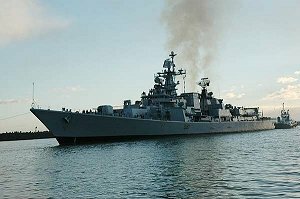 Cape Town saw the arrival of the destroyer INS Delhi (D61) and the Godavari class frigate INS Ganga (F21). These two ships were in Cape Town in early June. The fifth naval ship and third to visit Cape Town this month was RSS Formidable (pennant number 68), the first of an intended six Formidable class frigates, which was built for Singapore at the French Lorient shipyard in Brittany. RSS Formidable was launched back in January 2004 and has since undergone fitting out of the combat and platform systems. The next five ships of the class will be constructed in Singapore by Singapore Technology Marine. These five ships will be named RSS Intrepid (69), RSS Steadfast (70), RSS Tenacious (71), RSS Stalwart (72) and RSS Supreme (73) and all are intended to be in service by 2009. The design is based on the French Lafayette class stealth frigate but is smaller with less manning requirements – a 70 crew can operate the ship in full combat readiness. 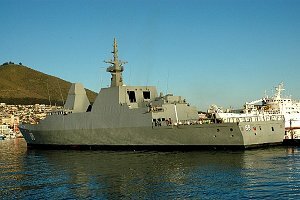 The new frigates will replace Singapore’s existing Sea Wolf missile gunboats.